With the January rush of the first Grand Slam event of the year now in the past, the anticlimactic month of February follows and it’s hard to get revved up about tennis – especially this year with the Sochi Olympics all over a variety of platforms. The first couple of weeks of the month with Davis Cup and Fed Cup opening rounds were relevant but even they were diminished this year as the men’s top two players – Rafael Nadal and Novak Djokovic – elected not to represent their countries (both lost) in Davis Cup. Serena Williams and Maria Sharapova did likewise with Fed Cup and the Americans and the Russians found themselves ousted in their first rounds. The most interesting story to come out of those two weeks had to be Roger Federer showing up (almost secretly) for the Swiss in Novi Sad against the Serbs with Novak Djokovic away skiing. The easy 3-0 Swiss victory has set up intriguing possibilities for the rest of the Davis Cup World Group year if main-men Federer and Stanislas Wawrinka can remain healthy. Federer-Wawrinka will be big favourites to defeat Kazakhstan at home in the quarter-finals in April and then will be the pick again when they host either Italy or Great Britain in the September semi-finals. Assuming they reach the final, that’s when things could get really interesting. The Swiss will likely face the French in France from November 21-23. If it materializes, it could be the best Davis Cup final since the USA (Sampras and Agassi) travelled to Lyon, France, in 1991 and lost to Guy Forget and Henri Leconte. The French team has been unequivocal about its goal of winning the Davis Cup this year – and everyone knows that it would mean to Federer to finally get his name on Dwight Davis’ famous silver salad bowl. We may be getting ahead of ourselves here – but Switzerland with Federer and Wawrinka vs. Jo-Wilfried Tsonga, Richard Gasquet and a strong supporting French cast in the final would probably play to as large an audience as it is possible to find anywhere in France in late November. Imagine also, with Wawrinka, Federer, Gasquet and Tsonga all potentially playing the week and weekend before in the ATP World Tour Finals in London, how careful those principals might be about not getting hurt ahead of that clash of titan nations. In the meantime, the men’s and women’s tours meander through Europe, the Middle East, South America and the United States on their way to the big March combined tournaments in Indian Wells and Miami next month. After suffering that devastating back injury that compromised his attempt to win his 14th Grand Slam title in the Australian Open final against Wawrinka, he has rehabbed and gotten over a stomach virus that forced him to miss last week’s ATP event in Buenos Aires. 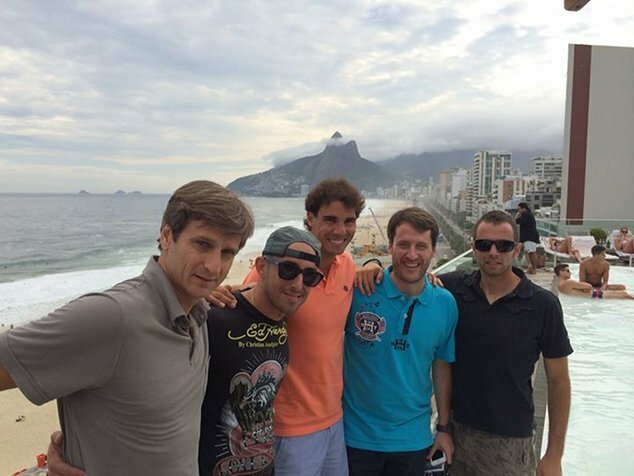 He (in picture above with friends, Sugarloaf Mountain is visible in background) returns to action this week at the new ATP 500 tournament in Rio de Janeiro. The tournament is on clay and the draw is full of familiar Latin country players, with only six non-Latins in the field. Redoubtable Rafa is almost a shoo-in to win his 43rd career clay-court title. Since losing to Wawrinka in the Australian Open quarter-finals, Djokovic has been skiing, dining out and practicing with suspended fellow-Serb Viktor Troicki, frolicking on a beach, eating crepes with a cousin in Geneva and working on his game at the Monte Carlo Country Club. He returns to action next week at the ATP 500 event in Dubai where he is defending champion. Murray didn’t play an ATP event after the US Open last year because of his back surgery. So far in 2014 he’s a respectable 9-3 – but still not quite himself as losses to Florian Mayer in Doha, Federer at the Aussie Open and Marin Cilic last week in Rotterdam have shown. He will play in Acapulco next week before joining the crowd for the BNP Paribas Open in Indian Wells beginning the week of March 3rd. I do enjoy the manner in which you have framed this specific matter plus it really does give me personally a lot of fodder for consideration. Nonetheless, coming from everything that I have experienced, I simply hope when the actual opinions pack on that people today continue to be on point and don’t start on a soap box regarding the news of the day. Yet, thank you for this exceptional point and though I do not really concur with the idea in totality, I regard your perspective. Music started playing any time I opened up this webpage, so irritating!